Does Tip Hardness Affect Cue Ball Spin? Q: Hey Tom! If I hit the cue ball a little bit to the right of the center of the ball, would I get the same result with any tip no matter how hard or soft it may be? I am under the impression that the softer tip would be in contact with the cue ball longer than a hard tip and therefore create more spin. Am I correct in that assumption? My second question would be do you think a harder tip is more forgiving than a softer tip due to the softer tip being on the cue ball longer? A: There are many myths about Pool cue tips and their performance. Sometimes it takes a bit of physics background for the truth to make sense. I'm not going to go into the physics here, so please accept that my answers are true in that they are backed up by solid science. The simple answer to your question about whether or not hitting the cue ball a little off-center will produce the same result for all tips is yes, it will produce the same result. The slightly less simple answer to the question is that it produces "pretty much the same result." If the tips are the same shape and diameter, you will get the same result. A more rounded tip can produce more spin for the same amount of offset. A thicker, stiffer shaft can produce more squirt. But, if the shafts are identical and the tips differ only in hardness, you'll get the same result with both harnesses. This video shows tip compression for super soft through extra hard pool cue tips at approximately six thousand frames per second. Even with the aid of the SUPER slow-motion playback it is difficult to notice much difference in the amount of time the tip is in contact with the cue ball. It's true that softer tips feature a longer contact time with the cue ball. Roughly, two thousandths of a second for soft tips at slow speeds, one thousandth of a second for hard tips, and half a thousandth for phenolic (break/jump) tips. You may feel or hear a difference in the hit, but you pretty much get the same amount of action for your one tip of offset in each case. The harder tip transfers a bit more speed into the cue ball. 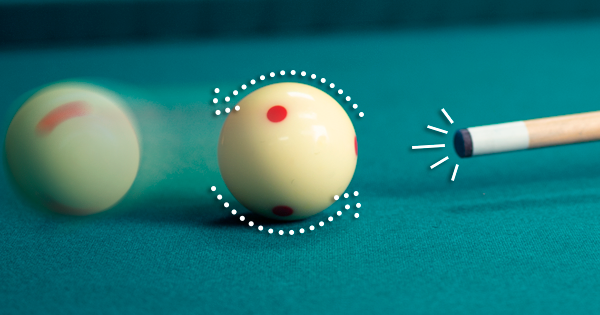 If the cue ball is traveling faster, there is less time for spin to wear off prior to striking the object ball, so from that perspective, it could appear to have more spin. This is a tiny factor. 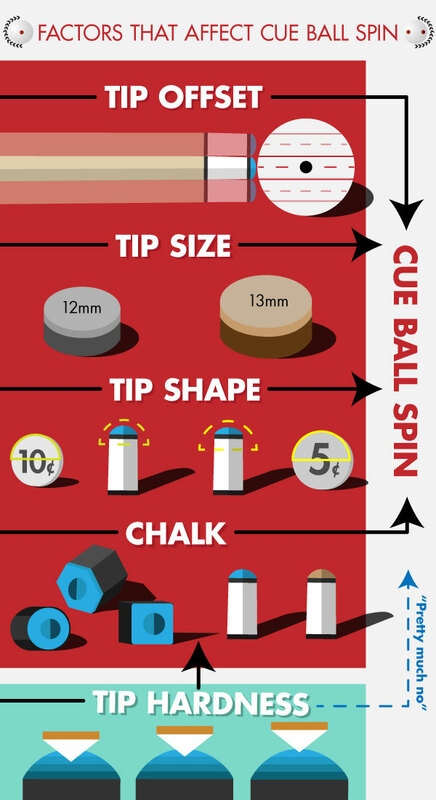 The factors that affect the amount of cue ball spin include: the amount of tip offset from the center, tip size, tip roundness and chalk (assuming the same stroke speed with zero stick angle). Tip hardness doesn’t have much affect directly on spin but softer tips hold chalk better which helps to generate cue ball spin. We can say that a softer tip is "more forgiving" than the harder tip because softer tips hold chalk better. Miscues are a little more likely with a hard tip, but unless you're hitting way off from the center of the cue ball this should not be an issue. A flatter tip shape could be seen as more forgiving in the sense that a flatter tip hits closer to the center of the cue ball for the same amount of shaft offset. Conversely, a rounder tip produces more action for the same offset. The rounder tip requires more precision from the player, and is therefore less forgiving. Frank Says: "The most popular tip (by far) that we sell and install right now is the Kamui Clear Black Soft tip. The feedback from that tip hardness feels a bit more firm than a typical soft tip but still hits softer than a medium. It holds both its shape and chalk well!"